Oscar fish are popular tropical fish for the home aquarium, but they can be tricky to keep healthy and happy in captivity. Here are some of the most frequently asked questions about Oscar fish care, behavior and more. How big should be my aquarium be to keep Oscar fish? Oscar fish can grow quite large, and they need plenty of room. 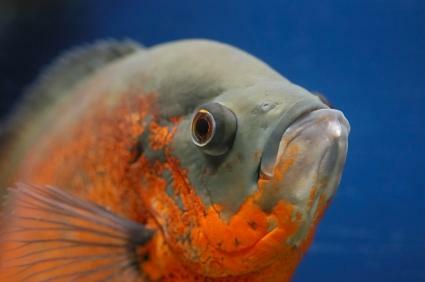 Experts on OscarFishLover.com recommend keeping only a maximum of two fish per 125-gallon tank. Others say you can keep two in a 75-gallon tank. Always give your fish more room than you think they need. Absolutely! All aquariums must have a working filter that is kept on at all times except during cleaning or maintenance. Filters remove solid debris, waste products and ammonia. Without filtration, your Oscar fish can be poisoned by its own waste products and decaying food. Always purchase a filter system matched to the size of the fish tank, and change the filter pads or cartridges according to the manufacturer's instructions. Can I add water right from the tap to the tank? No, you should always condition tap water using a conditioning kit from the pet store before adding it to an aquarium tank for any tropical fish, including Oscar fish. Chlorine and other chemicals found in tap water can poison your tropical fish. A few drops of water conditioner must be added to tap water to remove these chemicals before you pour the water into the tank. Additionally, icy cold water or very hot water can shock or injure your fish. What should I feed my Oscar? Choose a fish food from the pet store made for Oscar fish or other carnivorous fish. You can also supplement their diet with mealworms and other insects for fish that are sold at pet stores. Help! My Oscar jumped out of the tank. I am heartbroken. Why did he do this? There are many reasons why Oscar fish might jump from a fish tank. One simple reason is that he spotted something that looked like food to him. In the wild, Oscars live in slow-moving rivers or streams of fresh water, and they are carnivores so they frequently feed on insects. Any insects near the waterline attract your Oscar fish's attention, and even simple movements such as water droplets rolling off the rim can be mistaken for food. That's why it is critical to have a tight-fitting lid on top of your tank. Oscar fish are also very strong and can open lids if they jump up, so it's important to have a latch. My Oscar digs up the plants and gravel. What can I do? Unfortunately, you cannot change this behavior. Oscar fish are strong and curious, and they tend to pull up rocks and plants. If you're tired of investing in living plants because your Oscar fish are destroying them, switch to plastic plants. At least you can push them back into the gravel without too much trouble. Can I keep my Oscar fish with other fish? Choose tank companions for your Oscar fish very carefully. Oscar fish are semi-aggressive, according to OscarFishLover.com, and carnivorous. They'll eat small fish like guppies. On the other hand, there are some types of fish they coexist with fairly well. These include several other types of Cichlids. What should I look for when buying Oscar fish at the pet store? Look for Oscar fish that seem lively and active. They should have intact fins and no spots or holes on their heads or fins. Choose fish from clean tanks that appear to be well-kept. My Oscar fish has several small holes in his head. What is wrong with him? This could be something called Hole in the Head disease. Typically, this disease starts out with several small white holes or patches near the head and eyes. The holes eventually get deeper, resulting in fissures in the fish's skin. AquariumFish.net states that this disease may be caused by a combination of protozoa and bacteria. They recommend using medication available from a veterinarian to treat the disease, including Flagyl and antibiotics. It's better to prevent Hole in the Head disease than to treat it later. Keep your tank very clean. Use a filter designed for your tank size and change the filtration pads, charcoal or other filtration methods according to the manufacturer's direction. 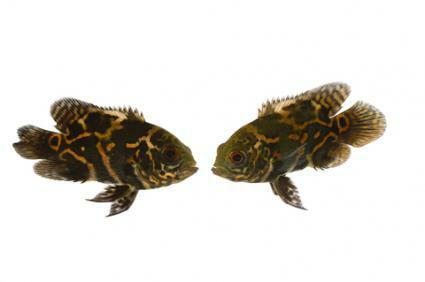 Always keep Oscar fish in a tank large enough for them; overcrowding often leads to diseases. How can I tell whether my Oscar is a male or a female? It's very difficult to tell the gender of your Oscar fish just by looking at it. Aquatic Community, in their article on breeding Oscar fish, recommends keeping six fish in a tank and watching to see if any pair off. The pairs are breeding pairs, and while you won't know for certain which one is the boy and which is the girl, your fish will know. My Oscar fish bred, but none of the eggs hatched. What went wrong? It's possible that the eggs weren't fertilized or some other natural problem prevented them from hatching. There's really not much you can do except wait. Many Cichlids lose their first batch of offspring, and it's actually quite normal for them to try a few times before successfully raising their first babies. Where do Oscar fish come from? According to the Florida Museum of Natural History, Oscar fish come from the upper areas of the Amazon river in Brazil and Peru. Thanks to irresponsible pet owners releasing their fish into the wild, there's also a population found in South Florida, according to the Museum website, but they aren't native to Flordai. 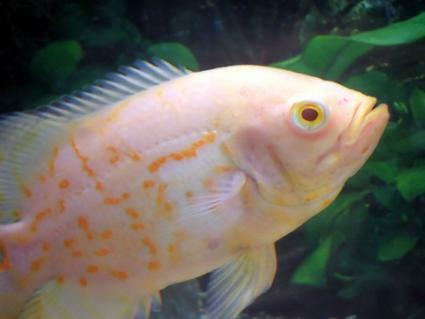 Why do some people call Oscar fish cichlids? Oscar fish can be fun, friendly pets. They have unique personalities and offer aquarium hobbyists another interesting fish to enjoy.